Honey bees intrigue, delight and fascinate Norman Gary. In fact, they have for 70 years. Seven decades. Yes, that's how long he's kept bees. Author of the 174-page popular book, Honey Bee Hobbyist: The Care and Keeping of Bees. There's another side to Norm Gary you may not know. He initiated and spearheaded the founding of the Western Apicultural Society (WAS) and served as its first president. So when WAS returns Sept. 5-8 to its roots--UC Davis--for its 40th annual conference, Gary will lead a nostalgic discussion on the founding of the organization. The presentation takes place at 8:45 a.m. on Wednesday, Sept. 5 in the Activities and Recreation Center (ARC). Extension apiculturist emeritus Eric Mussen will join him. Mussen, co-founder and founding vice president of WAS, is currently serving his sixth term as WAS president. Gary's career amounts to "the bees' knees." That 1920s phrase, meaning "the height of excellence," characterizes and defines him. In fact, you may remember the seven-piece jazz band that Gary formed--the Beez' Knees--that played professionally in the Sacramento area from 1995 to 2004. A musician since childhood, Gary plays clarinet (B-flat clarinet! ), alto sax, tenor sax and flute either in bands he's organized or with other professional musicians. He's entertained at the Sacramento Jazz Jubilee since 1979, wowing the crowds with such tunes as "When the Saints Go Marching In," "If I Had You," "Just a Little While to Stay Here," "New Orleans," "Long Way to Tippary" and "My Gal Sal." But back to the bees. Gary's interest in bees never wavered. He received his doctorate in apiculture at age 26 from Cornell University in 1959. While there, he was active in the Eastern Apicultural Society, the impetus for launching its counterpart, the Western Apicultural Society. 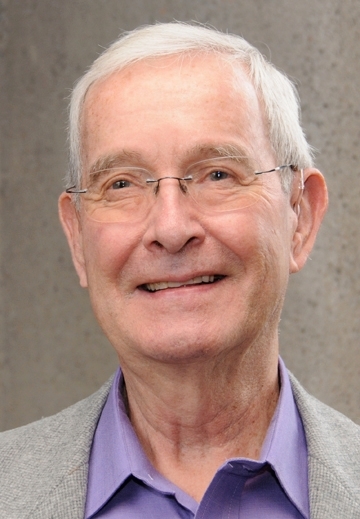 Gary joined the UC Davis faculty in 1962 and developed and taught the first insect behavior course at the university. He also developed and taught a graduate course on the use of television for research and teaching. He retired from academic life in 1994, but not from his bees and his music. A world-renowned professional bee wrangler, Gary trained bees to perform action scenes in movies, television shows and commercials. His credits include “Fried Green Tomatoes”; appearances on the Johnny Carson and Jay Leno shows; and hundreds of live Thriller Bee Shows in the Western states. He once trained bees to fly into his mouth to collect food from a small sponge saturated with his patented artificial nectar. He holds the Guinness Book of World record (109 bees inside his closed mouth for 10 seconds) for the stunt. 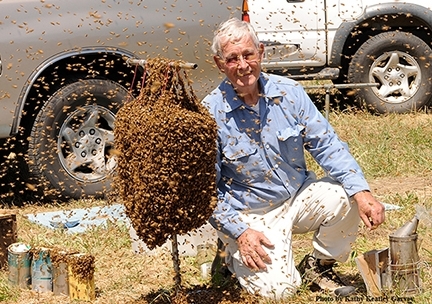 Like he's done much of his life, Norm Gary will focus on bees and music at the WAS conference. "Norm will talk about bees and his memories of organizing WAS," Mussen said, "and at our banquet, he will provide the background music." WAS Conference: It's a conference filled with educational topics, networking, field trips, a silent auction, door prizes and fun, Mussen said. Speakers will include bee scientists, beekeepers and industry representatives. Most events will take place in the UC Davis Activities and Recreation Center and surrounding facilities associated with the UC Davis Department of Entomology and Nematology, Conference participants will tour the Harry H. Laidlaw Jr. Honey Bee Research Facility, Häagen Dazs Honey Bee Haven (half-acre bee friendly garden), both part of the UC Davis Department of Entomology and Nematology; and Mann Lake Ltd., and Z Specialty Foods, both of Woodland. There's still time to register to attend the conference, which is open to all interested persons. Registration is underway at http://www.westernapiculturalsociety.org/2017-conference-registration/ or contact Eric Mussen at ecmussen@ucdavis.edu for more information. Jazz is music to his ears, but so are the bees. 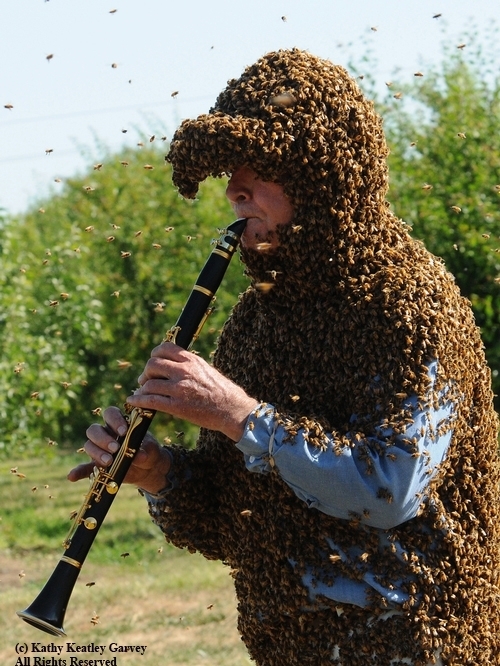 He's been beekeeping and playing the clarinet for 69 years. Meet Norman Gary of Citrus Heights, UC Davis emeritus professor of entomology who retired in 1994 after a 32-year academic career. As an apiculturist and researcher, he authored scores of peer-reviewed publications, and most recently wrote a how-to-book, The Honey Bee Hobbyist: the Care and Keeping of Bees. 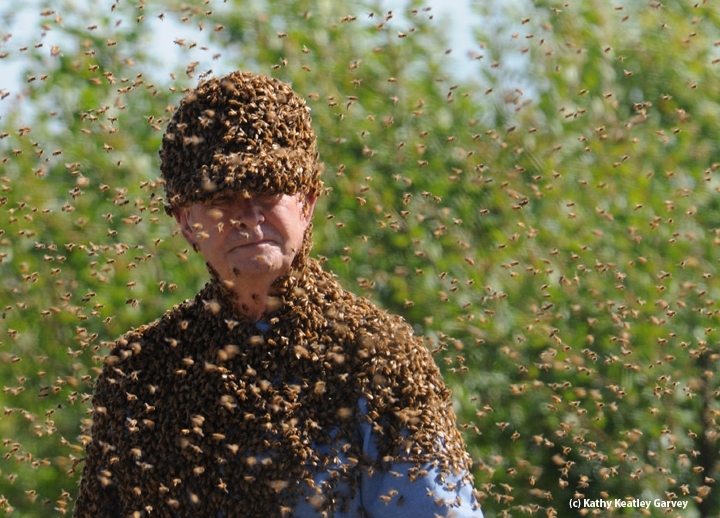 Gary, now 83, doesn't keep bees anymore. “I had to give up hobby beekeeping in 2015," he said, "because the equipment is too heavy for me to lift." Now he feeds wild bees in his yard like some folks do wild birds. And he feeds the birds, too. "They share feeders with no problem," he told us. "Been this way for a million years or more!" Determined to help bees thrive and survive, Gary feeds them with his patented artificial nectar. "I make it with ordinary table sugar … one part sugar and four parts water. Then I add one tiny drop for flavoring, such as anise, that provides a fragrance that attracts bees. Almost any flavor will work fine … peppermint, lavender, etc. My artificial nectar is as good, maybe better, than natural nectar. At least the bees respond 100 percent! People don't realize that table sugar (sucrose) is perhaps the purest natural product on the market. It is identical to the sucrose found in natural nectar." 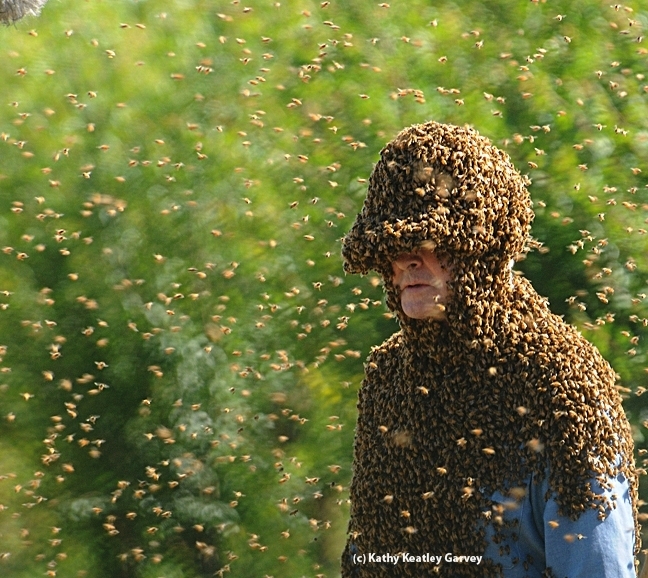 During his professional bee wrangler career spanning four decades, Gary trained bees to perform action scenes in movies, television shows and commercials. Among his credits: 18 films, including “Fried Green Tomatoes”; more than 70 television shows, including the Johnny Carson and Jay Leno shows; six commercials, and hundreds of live Thriller Bee Shows in the Western states. Mainly for educational purposes but also for entertainment, he launched the highly sophisticated Thriller Bee Shows, performing more than 100 times in three western states, with venues that included the California State Fair. 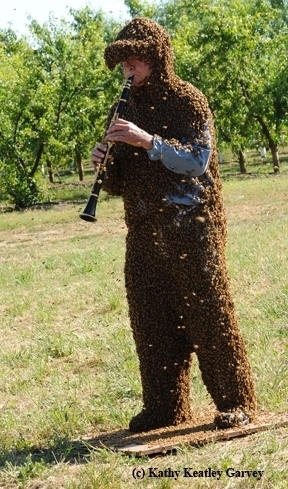 He drew widespread acclaim for wearing a head-to-toe suit of clustered bees while "Buzzin' with his Bee-Flat Clarinet." Gary once trained bees to fly into his mouth to collect food from a small sponge saturated with his patented artificial nectar. His holds the Guinness World record (109 bees inside his closed mouth for 10 seconds) for the stunt. 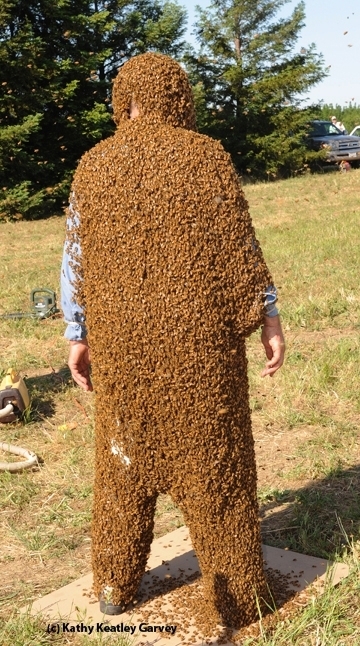 He's also the guy behind the "bee suit" record in the Guinness World Records; Gary clustered more than 87 pounds of bees on a friend. Today, as a musician, he plays the clarinet, alto sax, tenor sax, and flute. Most of his performances are at senior homes and private parties. He directs and performs with Four for Fun, Mellow Fellas Duo, and the Calamity Jazz Band. FOUR FOR FUN is considered a "popular 4-piece Dixieland band that plays happy, toe-tapping, upbeat, sing-a-long music that seniors love." The seniors' favorites include "Bill Bailey," "Bourbon Street Parade," "Do You Know What It Means to Miss New Orleans," "Georgia" and "Just a Little While To Stay Here." Said Gary: "We love to play at senior homes and also for Mardi Gras parties." All the musicians are seniors who have been playing professionally in the Sacramento area for more than 30 years. MELLOW FELLAS DU0. Norm Gary plays clarinet and sax, and Bill Rowland is the guitarist and vocalist. Many tunes are sing-a-longs that especially delight the seniors. (Hear samples of their music online at www.mellowfellas.com.) "At senior homes where we are regulars, we usually play three or four gigs per year," he said. CALAMITY JAZZ BAND. Norm Gary also has a Dixieland Jazz quartet that he books locally as the Calamity Jazz Band. The full Calamity Jazz Band is based in Eugene, Ore. "Whenever the two gals (trumpet and bass sax) who lead this band perform in the Sacramento area, I add a banjo player and we instantly have a wonderful band," he enthused. "We've been playing together for around six years at events in Oregon as well as California." DR. BACH AND THE JAZZ PRACTIONERS. Norm Gary plays sax and clarinet with this band, featured many times in the Sacramento Jazz Jubilee and the Sacramento Music Festival. (See details about the band.) Tonight (Nov. 30) they are performing at the Straw Hat Pizza in Rancho Cordova. A local television station, KXTV, Channel 10, recently spotlighted him as the "honey bee charmer of Citrus Heights." Meanwhile, Norm Gary is loving his post-retirement music career, just as he loves bees. And yes, he still has CDs of his Beez Kneez Dixieland band that he retired several years ago. In addition, Gary provides the sound system for what is billed as "the world's only all women banjo band, GIRLS GIRLS GIRLS," directed by his wife. It's all music to his ears—and so are the bees.